For the edible yam, see Chinese yam. For the root for papermaking, see Abelmoschus manihot. For the Sgt. Frog character, see Tororo (Sgt. Frog). For the district, see Tororo District. Tororo is a town in the Eastern Region of Uganda. It is the main municipal, administrative, and commercial center of Tororo District. There are many shops, banks, supermarkets here. Tororo is a trading hub where many people come from the surrounding villages to work. There are a number of ATM's around town with one at Barclay's accepting all major cards. MTN and Airtel mobile agents are throughout the town. Tororo was garrisoned by the Uganda Army's Air and Sea Battalion during the Uganda–Tanzania War (1978–79). On 2 March 1979, rebels loyal to Milton Obote attacked the town, whereupon part of the garrison defected while the rest was routed. Tororo was recaptured by the Uganda Army in a counter-attack two days later, though many local civilians were displaced by the fighting. A few weeks later, however, Amin's rule throughout Uganda collapsed and the garrison of Tororo mutinied yet again. This time, the remaining Amin loyalists were in no position to launch a counter-attack, and the mutineers subsequently handed over Tororo to Uganda National Liberation Front rebels. The town is approximately 10 kilometres (6.2 mi) west of the town of Malaba at the border between Uganda and Kenya. This is approximately 208 kilometres (129 mi), by road, east of Kampala, Uganda's capital and largest city. The geographical coordinates of the town are 0°41'34.0"N, 34°10'54.0"E (Latitude:0.692780; Longitude:34.181655). In 2002, the national census put the population of the town of Tororo at about 34,800. In 2010, the Uganda Bureau of Statistics (UBOS) estimated the population at 42,500. In 2011, UBOS estimated the mid-year population at 43,700. The 2014 national population census put the population at 41,906. 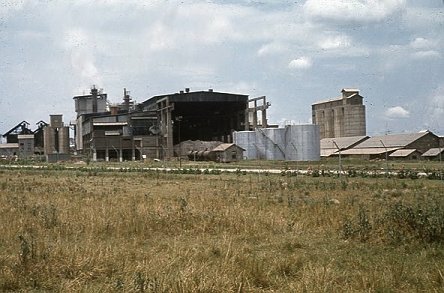 Tororo has a major cement works, Tororo Cement Limited, that in 2007, because of power shortages, could produce only 19,000 metric tonnes of cement daily against an installed capacity of 35,000 metric tonnes. It is also home to SEBA Foods, a food factory that was officially opened by the president of Uganda on 25 June 2010. Electromaxx Limited constructed a 20 megawatt thermal plant, Tororo Power Station, that was commissioned in June 2010. Tororo is also the location of Nilefos Minerals Limited, a subsidiary of the Madhvani Group of companies. Nilefos mines and processes phosphates for use in fertilizer and related industries. There are a couple of new factories being constructed on the outskirts of the town. One factory is on the way Busia is being built by a Chinese company. Transport in and out of the town is well served by Matatus (privately owned minibuses). There are stages for Mbale (UGX 5,000) near the shell garage, Jinja (UGX 10,000) (including Iganga, and onward travel to Kampala) on Jinja road just past the roundabout. Within town, Boda Bodas (motorbike taxis) are used for most journeys. These are cheap but not safe or regulated, caution should be used when travelling after rain or after dark. Journeys in and around town should cost between 500/= and 2,000/=. Tororo railway station on the Uganda Railway. Tororo marks the junction of railway lines to Pakwach, via Soroti, and to Kasese, via Kampala. Since 1993, the metre gauge line from Tororo Junction to Gulu and Pakwach has been out of use. Rift Valley Railways funded the clearing of the line east to Gulu of vegetation and repairing track and bridges, thus allowing the first commercial train for 20 years to run through on the metre gauge track from the Kenyan port of Mombasa through Nairobi and Eldoret to the Kenyan frontier in Tororo and onwards to Gulu on the line to Pakwach on 14 September 2013. Tororo has a tropical monsoon climate with a short dry season The average annual temperature is 22.4 °C (72.3 °F) (average high 28.7 °C (83.7 °F) and average low 16.2 °C (61.2 °F)). Average annual precipitation is 1,494 millimetres (58.8 in). Tororo has many thunderstorms and may be the place where thunder occurs on more days than any other place on Earth. From September to December there is rain most days in the late afternoon. The drier and hotter season starts in December. The tourist attraction of the town is the dominating rock outcrop that overlooks the town. It is a hike that takes around an hour to the top. There used to be a cable car that took people to the top but this was closed down after a couple of people died in an accident. There is a fee for a tour guide at the bottom of the rock, just off the golf course. The Tororo central market has been knocked down (Sept 2017) to make way for a new indoor shopping centre that is predicted to be finished in 2020. This has led to a new market starting nearby in water village. Tororo Hospital,a 200-bed public hospital administered by the Uganda Ministry of Health. 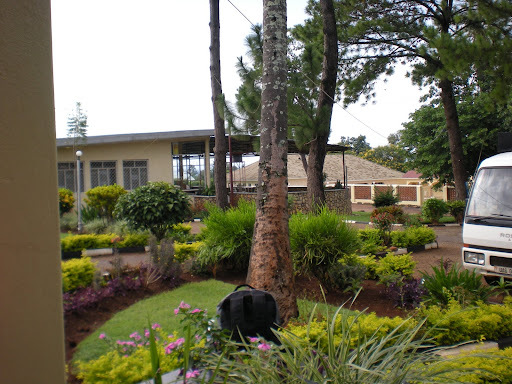 Divine Mercy Hospital is a well equipped hospital on Jinja road. Tororo–Mbale–Soroti Road begins here and continues in a northwesterly direction, to end 158 kilometres (98 mi) away at Soroti. Busitema University, one of the six public universities in Uganda, located 28 kilometres (17 mi), by road, southwest of the central business district of Tororo town. ^ a b UBOS (27 August 2014). "The Population of The Regions of the Republic of Uganda And All Cities And Towns of More Than 15,000 Inhabitants". Citypopulation.de Quoting Uganda Bureau of Statistics (UBOS). Retrieved 26 February 2015. ^ Cooper & Fontanellaz 2015, p. 62. ^ Darnton, John (5 March 1979). "Amin's Rule in Uganda Imperiled As Tanzanian Force Nears Capital". New York Times. Retrieved 22 December 2018. ^ McManus, James (3 March 1979). "Amin's mutinous troops create a second front front". The Guardian. Retrieved 22 December 2018. ^ Cooper & Fontanellaz 2015, p. 36. ^ Globefeed.com (26 February 2018). "Distance between Post Office Building, Kampala Road, Kampala, Uganda and Tororo Post Office, Malakisi Rd, Tororo, Uganda". Globefeed.com. Retrieved 26 February 2018. ^ Google (26 February 2018). "Location of Tororo, Tororo District, Uganda" (Map). Google Maps. Google. Retrieved 26 February 2018. ^ UBOS. "Estimated Population of Tororo In 2002, 2010 & 2011" (PDF). Uganda Bureau of Statistics (UBOS). Retrieved 11 May 2014. ^ Kaujju, Peter (11 July 2007). "Cement shortage pushes retail price to sh25,000". New Vision. Retrieved 26 July 2015. ^ Ibrahim Kasita, Henry Mukasa and Moses Nampala (24 June 2010). "Power cuts to go - Museveni". New Vision. Retrieved 26 July 2015. ^ Ssonko, Kiganda (12 May 2008). "Madhvani to invest $535m in Tororo phosphates mining". New Vision. Retrieved 26 July 2015. ^ Staff, Writers (9 October 2013). "Uganda's Northern Line revived". Railway Gazette International. Retrieved 26 July 2015. ^ "Average Weather in Tororo, Uganda, Year Round - Weather Spark". weatherspark.com. Retrieved 2017-07-06. ^ Summerweb. "Climate Tororo - Uganda". www.climatedata.eu. Retrieved 2017-07-06. ^ Sekanjako, Henry (25 July 2012). "Delayed Tororo-Mbale-Soroti road to cost more money". New Vision. Kampala. Retrieved 29 August 2015.
Cooper, Tom; Fontanellaz, Adrien (2015). Wars and Insurgencies of Uganda 1971–1994. Solihull: Helion & Company Limited. ISBN 978-1-910294-55-0. Wikimedia Commons has media related to Tororo, Uganda. Wikivoyage has a travel guide for Tororo.